Google announced today the addition of a new service to its social network offerings: Google+ Local. The company's latest endeavor aims to make finding, discusssing and sharing local businesses with friends and the public as simple as possible by tying together several Google products under a single Google+ tab. While the new service is currently a plus-only affair, in the near future, its features will be conjured up via Google Maps or a simple Google search. While users wait for the rollout though, Google Maps already offers business listings, reviews and information. Google+ Local is simply a more refined, locally-minded, socially-aware tool with a few new bells and whistles. So, what's different? Well, you can check out Google+ Local for yourself on Google+, but there are really only two items which separate the service from existing Google offerings: the integration of Zagat data (i.e. scores, ratings, data and reviews) and a searchable page dedicated to Google+ Local listings. Zagat, a well-known food and entertainment review service steeped in over 30 years of history, plays a central role in Google+ Local. This may explain Google's acquisition of Zagat in 2011, a deal which featured a $151 million price tag. While a substantial number in most respects, the price for Zagat was little more than a rounding error when compared to Google's recent purchase of Motorola Mobility for $12.5 billion. 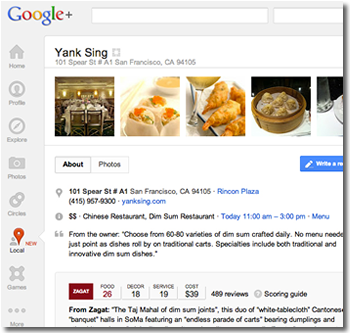 Google+ Local decidedly competes with services like Yelp, but even with Zagat's help, it will take some time before Google's latest project offers the same breadth of reviews, depth of business participation and bustling user community. Currently, Yelp curates over 28 million reviews and attracts 71 million unique sets of eyeballs every month. By comparison, recent estimates peg the number of total monthly Google+ visitors at just under 70 million.